Severe osteoarthritis occurs when cartilage is destroyed completely, so that bone rubs on bone. The friction causes inflammation in the joints thereof, which is characterized by a framework of arthritis, hence the name osteoarthritis (Arthritis = inflammation of the joint). There are about one hundred diseases that can cause arthritis, arthrosis (osteoarthritis) being the most common. If you want more information about the differences between osteoarthritis and rheumatoid arthritis, read: arthritis and osteoarthritis. 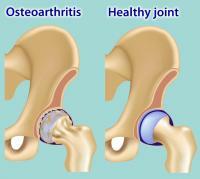 Osteoarthritis is very rare before 40 years old and very common after 60. For a long time it was thought that degeneration of the joint, and consequently arthrosis, was a natural aging process. It is now known that age is a major risk factor, but not the only one. 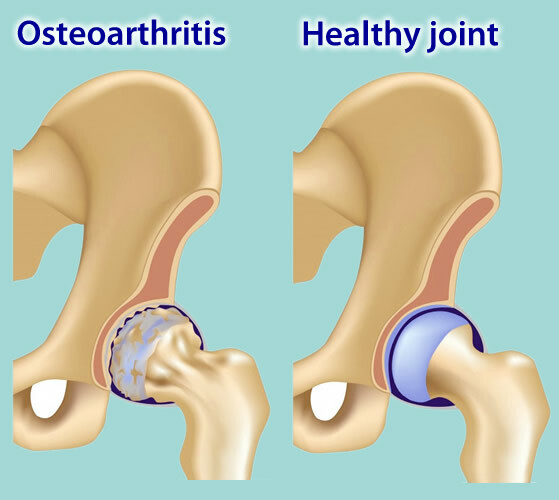 Besides age among other risk factors for osteoarthritis are: obesity (especially for osteoarthritis of the knee), being female (women are up to 3 times more likely to develop osteoarthritis than men), lack of practice exercises (except the high impact on the joints, which can lead to osteoarthritis), genetic predisposition, etc. Osteoarthritis may be primary, when there is no apparent cause except age, or secondary, when it arises due to trauma in joints, bone deformities, obesity, diabetes, etc. The joints most commonly affected by osteoarthritis are hands, knees, hips and spine. The main symptom of osteoarthritis is pain that usually worsens with exertion and is relieved at rest. Pain is usually worse at the end of the day and after long periods of immobilization, as in airline travel or cinema seats. Some patients experience worsening of pain with changes in climate. As osteoarthritis progresses, pain can arise with increasingly less intensive activities, which can ultimately occur even at rest and at night. Osteoarthritis in advanced stages is a crippling disease. Pain is not caused directly by cartilage injury since it has no innervation. This means that some patients with severe cartilage lesions, visible on radiographs, may have few complaints of pain, while others with less visible injuries may have more evident symptoms of osteoarthritis. Stiffness is also a common complaint in patients with osteoarthritis. The stiffness of the joints is common some time after waking up, enhancing after about half an hour. During the day episodes of joint stiffness can also arise, especially after periods of inactivity. The joint affected by osteoarthritis usually has lower mobility and may be swollen, hot and crackles while moving.